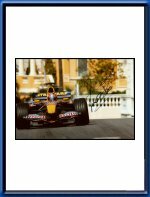 Vitantonio Liuzzi signed Red Bull Racing Photo. This is great and LARGE photo of Vitantonio at work in his 2005 Red Bull Racing RB1 at the Monaco Grand Prix when Red Bull had joined forces with George Lucas to promote the then-new Star Wars movie Episode III with special Star Wars liveries for the cars and the pit crew being dressed as Clone Troopers. A rare relic from the very first beginning of Red Bull Racing! Vitantonio personally signed this photo with a black marker. It measures approximately 30 x 20 cm or 12 x 8 inches (A4 size! ).